singing the songs in the presence of the police officers what was recorded in the internet. 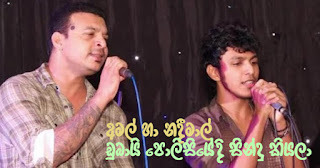 Thus after playing their songs in the internet in front of the police officers, the police have confirmed that Amal and Nadeemal are popular singers, he mentioned. In the meantime, according to the blood sample of Nadeemal Perera, Bur Dubai Police have confirmed that he has not used illicit drugs, Attorney at Law has informed. Those officers have mentioned that blood sample records of those presently in custody have so far not been received and under the present circumstances it will not be difficult for Nadeemal to attain freedom.